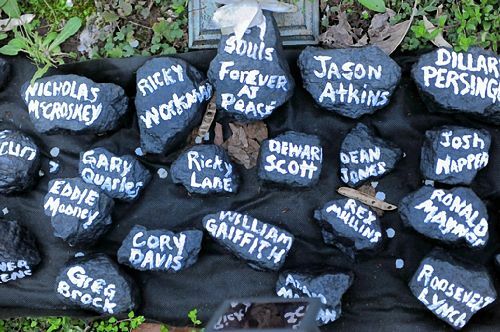 Shortly after the mine disaster, this temporary memorial to the victims went up along Route 3 in Whitesville, W.Va., with their names on lumps of coal. A former key executive of the company that owned the Upper Big Branch mine in West Virginia where 29 miners were killed in an underground explosion in 2010 has been charged with violating mine safety laws and conspiring to impede federal mine inspectors. David Hughart, 53, of Crab Orchard, W.Va., former president of Massey Energy Co.’s Green Valley Resource Group, was charged Wednesday in federal district court in Beckley, W.Va.
Federal prosecutors said Mr. Hughart, the highest-ranking official charged to date in an ongoing investigation, has agreed to plead guilty and is cooperating with the investigation spurred by the Upper Big Branch tragedy, the nation’s worst mining disaster in four decades. Mr. Hughart’s plea agreement may indicate prosecutors are targeting officials higher on the Massey executive chain, possibly including controversial former CEO Don Blankenship, whose critics said valued profits at the expense of safety. He retired at the close of 2010. His Washington, D.C., attorney was unavailable for comment Wednesday. Four investigations into the Upper Big Branch disaster concluded that poorly maintained machines used to cut into sandstone caused a spark that ignited methane gas. Broken water sprayers then failed to stop the fire, which set off a series of explosions fueled by coal dust. Those investigations concluded that Massey systematically covered up problems at the mine through an elaborate scheme that included sanitized safety-inspection books and a system providing advance warnings of surprise inspections by federal mine safety officials. The wide-ranging probe of Massey has found that the company’s actions that compromised safety weren’t confined to Upper Big Branch. “Mine safety and health laws were routinely violated [at coal mines] owned by Massey in part because of a belief that consistently following [mine safety] laws would decrease coal production,” according to the information filed against Mr. Hughart. Authorities accuse Mr. Hughart of working with “known and unknown” co-conspirators to ensure that miners underground at Massey-owned operations received advance warning about surprise federal inspections “on many occasions and various dates” between 2000 and March 2010. The advance warnings provided them the time to conceal violations that could have led to citations, fines and costly production shutdowns. The United Mine Workers of America, which consistently has criticized Massey’s safety record, was quick to react to Mr. Hughart’s charges. In December, federal Mine Safety and Health Administration officials announced a $209.5 million settlement agreement with Virginia-based Alpha Natural Resources, which took over Massey and the mine in a June 2011 merger. The firm has since announced it will seal the mine. The settlement prevented criminal charges against the company, but did not preclude charges against individual employees. Federal authorities said the firm is assisting in the investigation, in which three former Massey employees have been charged thus far. Gary May, the former superintendent of the Upper Big Branch mine, pleaded guilty in March to a federal fraud charge. Prosecutors said Mr. May manipulated the mine ventilation system during inspections to fool safety officials and disabled a methane monitor on a cutting machine a few months before the explosion. In February, Hughie Elbert Stover, 60, the former security chief at Upper Big Branch mine, was sentenced to three years in federal prison for lying to investigators and ordering a subordinate to destroy documents following the deadly explosion. Michael A. Fuoco: mfuoco@post-gazette.com or 412-263-1968. My friend Niko Black has lived in the home she owns for over twenty years. She was perplexed when Wells Fargo took possession of her home and then evicted her — especially since she doesn’t have a mortgage or account with them at all. How could Wells Fargo take control over a home they don’t own? Niko posted a court order protecting her from eviction on her door, but local police broke into her home and forced her to leave at gunpoint as she struggled to pull her frail body into her wheelchair. I know that other people like Niko have used Change.org successfully to stop banks from foreclosing on them — that’s why I started a petition asking Wells Fargo to comply with a federal court order and allow my friend Niko back into her home. Click here to sign my petition. Niko has a rare form of cancer that keeps her homebound. Her health is so fragile that she had a seizure during the eviction — and she says the police did nothing to help her as she grasped for her medication. It wasn’t even until another friend arrived at the scene that an ambulance was called. Niko’s home is specially set-up to assist her daily nursing care and physical therapy. The head of her hospital has even written in support of returning her home immediately. Each day that Niko cannot access her home care jeopardizes her critically unstable condition. I can’t stand to see my friend continue to suffer. Click here now to sign my petition asking Wells Fargo to allow my friend Niko back into her home and stop this unlawful foreclosure — before her condition worsens.